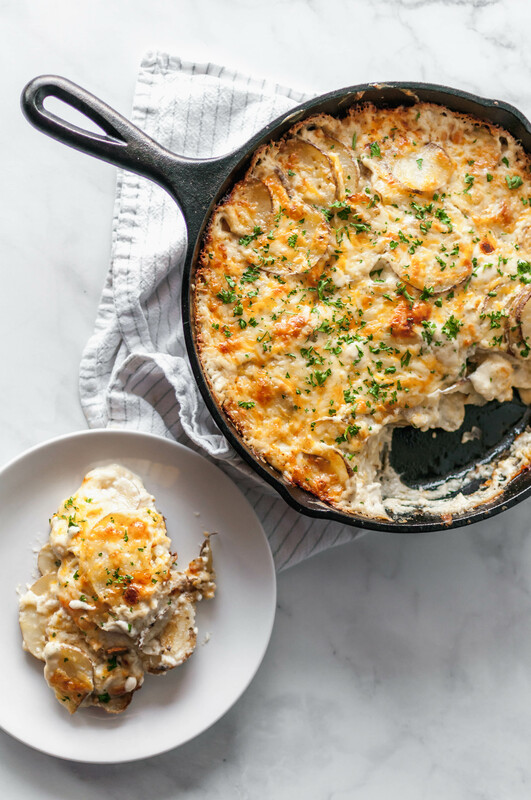 These Outrageous Au Gratin Potatoes are the definition of holiday side dish. Incredibly rich and cheesy, these are just what you need on your Easter table. Last week I promised two Easter slam dunk recipes and first I delivered with these light and fluffy Honey Wheat Rolls. Today I’m sharing the second recipe, these ridiculous Outrageous Au Gratin Potatoes. And they are ridiculous in ALL THE RIGHT WAYS. I really hope you guys do the whole traditional Easter meal with ham and all the fixings because these potatoes are just begging to be a star on that table. Three cheeses, heavy cream, perfectly tender potatoes, delicious spices. I’m seriously still dreaming about this decadent, gooey, crispy edged dish. Let’s start with the cheeses friends. First, sharp white cheddar. Because everything should have sharp cheddar in my opinion. A good amount of smoked Gouda is mixed in there too for some rich, smoky goodness. Lastly, Colby for its creamy, mild flavor. All the cheeses get mixed together than layered with the cream soaked potatoes. That means you get a melty, gooey layer of cheese in the middle of the dish and a crispy, crunchy layer on top. If you don’t think that’s outrageously delicious I don’t know what to tell you. I chose to bake these potatoes in a cast iron skillet for even more color and crispiness on the edges. When it comes to a brownie or cake, I’m always a middle kind of girl but these potatoes?! If I had it my way I would eat all around the edges for that crispy cheese. And I wouldn’t be sorry about it either. Can you imagine that with some sweet, salty ham? I just CANNOT wait to make this again at Easter and I hope you all do too. Preheat oven to 400 degrees F. In a medium sized saucepan, bring heavy cream, salt, garlic powder, onion powder and pepper to a simmer and cook for 3 to 5 minutes, until slightly thickened. Remove from heat and stir in potatoes and let sit while you grate the cheeses. Lightly oil a cast iron skillet or 8x8 baking dish. Layer half the potatoes into the skillet, leaving as much cream in the saucepan as possible. Sprinkle half the cheese over the layered potatoes. Layer remaining potatoes over the cheese. Pour cream left in saucepan evenly over the potatoes. Top with remaining cheese. Cover lightly with foil and bake for 40 minutes. Remove foil and bake another 30 minutes uncovered or until potatoes are tender when poked. Sprinkle with parsley after removing from oven. These look amazing! Thank you for sharing. Could you assemble them ahead of time and bake after refrigeration? I’m wondering if they could be assembled before church and baked afterwards. Thanks so much!!! Hey Meg! Thanks so much! Yes, you could definitely assemble them a few hours ahead of time and bake them later. Hope you love them!! Outrageously….delicious! The visual on these is off the hook and based on reading thru the recipe I bet the flavor is even better. Thanks so much! They are my new favorite.